Charities who work with Christian communities overseas know well that as they work with those under anti-Christian persecution, they will invariably bump up against the issue of doctrinal differences. While it is a long trip from marginalization to martyrdom, doctrinal difference will be an issue that American Christians must likewise consider as we move into cultural marginalization of our own. At an event titled a “Celebration of Christian Unity,” the head of the Roman Catholic church recently suggested that those hostile toward Christ don’t see doctrinal distinctions; he concluded that this should spur us toward ecumenism – that the “devil has created our differences and that we are all one in the blood” of Christ. I made a similar point in a lecture more than a year ago – those hostile to the name of Christ do ignore doctrinal distinctions. However, I maintain that in light of this reality, we still must guard against the easy dismissal of doctrinal differences. How then, do we reconcile the global reality of the oppressive culture’s perspective, yet still resist tipping over into an uncomfortable ecumenism? The first perspective is the TRANSCENDENT PERSPECTIVE. In this perspective, the blood of Christ is the standard for orthodoxy. This perspective belongs to God alone. Only He knows the intricacies and motives of each heart, if a person is truly in union with Him. While some doctrines are closer than others to the heart of Scriptural Truth, men and man-made doctrines still fall short in fully embracing and expressing all that the Bible teaches. Only the Word of God accomplishes this in perfect fullness, through the infallible written word and applied through the Word incarnate – the Person of Jesus Christ. The scriptures are replete with the fact that God alone knows and weighs the hearts of men. [ii] Under this rubric, a nominal or traditional Christian in name only may shift to fidelity and confession of Christ at the moment of his death, and become a true Christian martyr. As a representative from the Barnabas Fund UK shared with me recently, it is easy for the “non-persecuted” to judge a martyr’s death from behind a computer, with no sword at his or her throat. Some churches that hold to confessional standards use Scripture to expound on these three principles: “This universal church has been sometimes more and sometimes less visible. Particular churches, which are members of it, are also more or less pure, depending on how the gospel is accepted and taught, how the ordinances of God are administered, and how public worship is performed. The purest churches under heaven are subject both to impurity and error. Some churches have so degenerated that they are not churches of Christ, but synagogues of Satan. Nevertheless, there will always be a church on earth to worship God according to his will, and there is no other head of the church than the Lord Jesus Christ.”[vi]. Scripture makes room for the first and second perspectives. Our doctrine, though it is vital to the health of the Church, will not save us. Ultimately, we are saved by grace, through faith in Christ. For those who hold more closely to their doctrinal position, we hope that simply understanding that these who suffer are made in God’s image is enough to stir a compassionate response. If we cannot agree on who qualifies as a member of the “household of faith,” then we can at least agree that all individual humans possess intrinsic value that affords humans many rights, the least of which is to be treated humanely despite religious belief and practice. The third and final perspective in our triad is the EXTERNAL PERSPECTIVE, in which the non-Christian culture surrounding the Church establishes itself as the standard for a perverted or distorted orthodoxy. In this perspective, the surrounding culture knows nothing of doctrinal distinctions; the opposing culture does not distinguish between nominal Christians, heretical Christians, or orthodox believers. A quick look through the Gatestone Institute’s report from 2013 reflects just one hostile culture’s disregard for the in-house differences that define us. Indeed, it is true that the surrounding culture sees one label only, “Christian” — either through a professed faith in Christ alone, by disagreeing with the surrounding culture, or in a sociological way such as holding a traditionally Christian surname through a government identity card. In some cultures, mere association with the name of Christ sometimes indict us – not merely fidelity to Scripture. 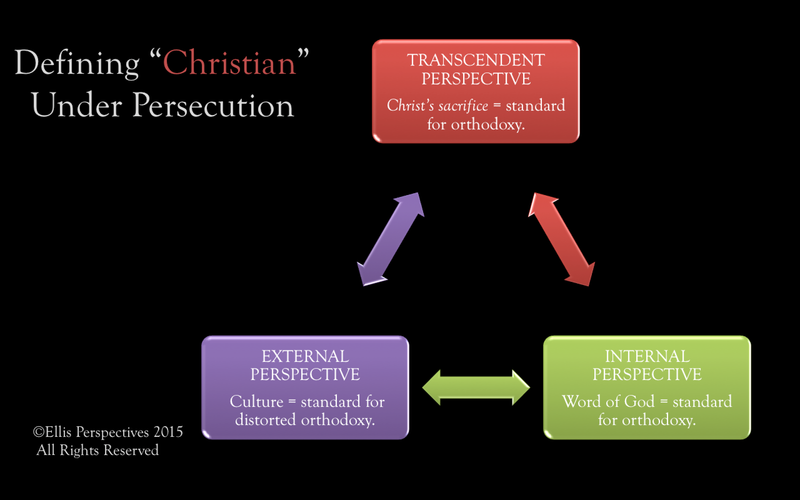 We cannot afford to be indifferent about our doctrinal differences, but whether we are advocating for the persecuted Church or simply responding to media reports of “Christian martyrdom” that lack nuance and also ignore doctrinal distinctions, the challenge for the Christian is to hold all three of these perspectives in tension. All three perspectives reflect reality, and must be taken together. By only focusing on one or two of the perspectives, we ignore some aspect of reality and create for ourselves an ecclesial schizophrenia. As I have been known to teach, the road is long from marginalization to martyrdom. Yet as Western culture becomes more hostile toward Christianity in general, Western Christians must learn to navigate these differences in practice, and not merely in theory. Holding the three perspectives in tension will aide us as we work together to preserve religious freedoms – freedoms that will be beneficial to all, for they afford us the license to dialogue, correct, rebuke, discipline, warn and encourage … with all liberty. [i] Steele, Shelby. Shame: How America’s Past Sins Have Polarized our Country. p16. [v] Matthew 18:17; Acts 20:28-31a; Rom. 16:17-18a; 1 Cor. 5:1-5, 13; 14:33, 40; Gal. 6:1; Eph. 5:6, 11; 2 Thess. 3:14-15; 1 Tim. [vi] Westminster Confession of Faith, Chapter 25, Of the Church, pp. 123-128. This post and diagram really helped me. Thank you Karen! K.A….so very grateful for your clear-minded compassion.